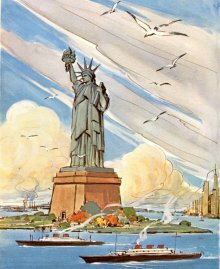 What does the Statue of Liberty represent? ... How tall is the Statue of Liberty and why is the Statue of Liberty green? ... Where is the Statue of Liberty located and what is the Statue of Liberty poem and quote? Answers, facts, history, pictures and Statue of Liberty coloring pages below. Click a picture below to go to the large printable Statue of Liberty coloring pages.